Loeber Motors prides itself in being one of Chicagoland’s most prolific luxury car dealerships. With a robust selection of Porsche vehicles on hand. Chicago, IL car shoppers have plenty to choose from when they step on the Loeber Motors lot. Luxury cars like the Porsche 911 Porsche Cayenne, many of the industry’s most incredible vehicles call Loeber Motors home. While we are based in Lincolnwood, we are proud to serve the entire Chicagoland community, including Evanston, Northbrook, Park Ridge and many other nearby locations. In the search for a new, certified or pre-owned Porsche, Loeber Motors remains a go-to location for luxury car shoppers. 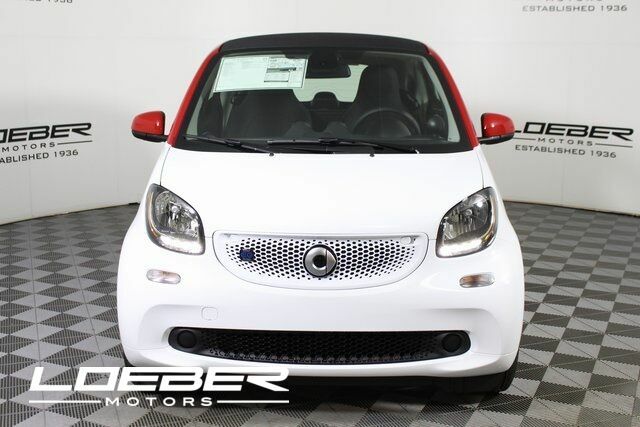 2018 smart Fortwo electric drive Passion RWD Zytek Permanent Magnet Motor Single-Speed Automatic Red Backup Camera, Bluetooth, Hands-Free, ABS brakes, Electronic Stability Control, Heated door mirrors, Illuminated entry, Low tire pressure warning, Remote keyless entry, Retractable Cargo Cover, Traction control. With Available Options Like ABS brakes, Electronic Stability Control, Heated door mirrors, Illuminated entry, Low tire pressure warning, Remote keyless entry, Retractable Cargo Cover, Traction control, 2 Speakers, Air Conditioning, AM/FM radio, Automatic temperature control, Brake assist, Bucket Seats, Bumpers: body-color, Driver door bin, Driver Seat Height Adjuster, Dual front impact airbags, Dual front side impact airbags, Exterior Parking Camera Rear, Front anti-roll bar, Front Bucket Seats, Front wheel independent suspension, Heated & Power Adjustable Exterior Mirrors, Knee airbag, Leather Multifunction Steering Wheel, Leather Shift Knob, Occupant sensing airbag, Outside temperature display, Overhead airbag, Panic alarm, Passenger door bin, Passenger Footwell Cargo Net, Passenger vanity mirror, passion base upholstery, Power door mirrors, Power steering, Power windows, Radio data system, Radio: smart Audio System, Rear fog lights, Rear window defroster, Rear window wiper, Security system, Speed control, Speed-Sensitive Wipers, Spoiler, Sport steering wheel, Steering wheel mounted audio controls, Trip computer, Upholstery Fabric, and Wheels: 15" 5-Twin-Spoke Light-Alloy Vehicle may not have all options as described due to automated process. Loeber Motors prides itself in being one of Chicagoland’s most prolific luxury car dealerships. With a robust selection of Mercedes-Benz and Porsche vehicles on hand, as well as leading vehicles from Sprinter and Smart, in Chicago, IL Loeber Motors . 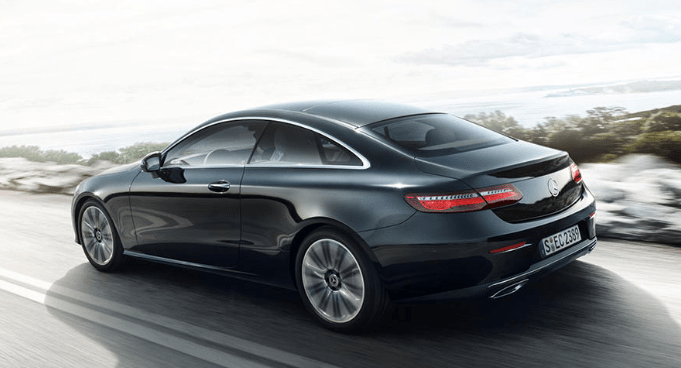 Mercedes-Benz C-Class, Porsche 911 utility vehicles like the Mercedes-Benz GLC and the Porsche Cayenne, While we are based in Lincolnwood, we are proud to serve the entire Chicagoland community, including Chicago, Glenview, Evanston, Northbrook, and Park Ridge. New Used Certified pre-owned Mercedes-Benz or Porsche, Loeber Motors remains a go-to location for luxury car shoppers. Vehicle may not have all options as described due to automated process. 2019 Mercedes-Benz S-Class S 560 4MATIC® 4MATIC® 4.0L V8 9-Speed Automatic Black Sunroof / Panorama Roof, NAVIGATION!, Backup Camera, Bluetooth, Hands-Free, AWD / 4WD, Keyless Entry, Leather Seats, Premium Wheels, Premium Sound, Premium Package, BLIND SPOT ASSIST, KEYLESS-GO, Heated and Ventilated front seats. With Available Options Like AMG Line Exterior (AMG Line Exterior (772)), Chauffeur Package Rear, Driver Assistance Package (Active Distance Assist DISTRONIC, Active Lane Change Assist, Active Steering Assist, Automatic Speed Takeover, Extended Restart by Stop & Go, Route Based Speed Adaptation, and Speed Limit Assist), Driver Assistance Package (23P), KEYLESS GO Comfort Package, Premium Package (Active Parking Assist, Front Variable Heated Seats, HANDS-FREE ACCESS, Heated & Ventilated Front Seats, KEYLESS GO®, Multicontour Front Seats w/Massage Feature, Power Rear-Window Sunshades, and Surround View Camera), PRESAFE Rear Package, PRESAFE Rear Seat Package (Outboard Rear Seatbelt Airbags and Rear PRESAFE Belt Buckles), Rear Seat Entertainment Package, Rear Seat Package (4-Zone Climate Control, EASY-ADJUST Headrests, and Electrically Adjustable Right-Rear Footrest), Sport Package Code, Warmth & Comfort Package (3-Spoke Wood & Leather Steering Wheel, Heated & Active Ventilated Rear Seats, Heated Front Armrests, Heated Rear Armrests, Heated Steering Wheel, Power Rear Seats, Rear Memory Seats, and Rear Variable Heated Seats), Warmth & Comfort Package (P69), 13 Speakers, 19" Multi-Spoke Wheels, 20" Twin 5-Spoke Wheels, 4-Wheel Disc Brakes, ABS brakes, Adaptive suspension, Air Conditioning, AM/FM radio: SiriusXM, Android Auto, Anti-whiplash front head restraints, Apple CarPlay, Auto High-beam Headlights, Auto tilt-away steering wheel, Auto-dimming door mirrors, Auto-dimming Rear-View mirror, Auto-leveling suspension, Automatic temperature control, Blind spot sensor: Blind Spot Assist warning, Brake assist, Bumpers: body-color, Burmester Surround Sound System, CD Player in Glove Box, Child-Seat-Sensing Airbag, Chrome Door Handle Inserts, Compass, Delay-off headlights, Door auto-latch, Driver door bin, Driver vanity mirror, Dual front impact airbags, Dual front side impact airbags, Electronic Stability Control, Exclusive Trim (Additional Wood Trim), Exterior Parking Camera Rear, Four wheel independent suspension, Front anti-roll bar, Front Bucket Seats, Front Center Armrest, Front dual zone A/C, Front reading lights, Garage door transmitter: Homelink, Genuine wood console insert, Genuine wood door panel insert, Head restraints memory, Head-Up Display, Heated door mirrors, Heated Front Seats, Heated front seats, HVAC memory, Illuminated entry, Knee airbag, Low tire pressure warning, Memory seat, Nappa Leather Upholstery, Navigation system: COMAND, Occupant sensing airbag, Outside temperature display, Overhead airbag, Overhead console, Panic alarm, Passenger door bin, Passenger vanity mirror, Power adjustable front head restraints, Power adjustable rear head restraints, Power door mirrors, Power driver seat, Power moonroof: Panorama, Power passenger seat, Power steering, Power windows, Premium audio system: COMAND, Pre-Wiring for CD Player, Radio data system, Radio: COMAND w/Navigation, Rain sensing wipers, Rear anti-roll bar, Rear fog lights, Rear reading lights, Rear seat center armrest, Rear side impact airbag, Rear Spoiler, Rear Window Blind, Rear window defroster, Rear-Seat Entertainment, Remote Controls, Remote keyless entry, Security system, SiriusXM Satellite Radio, Smartphone Integration Package - Apply CarPlay, Android Auto, Speed control, Speed-sensing steering, Steering wheel memory, Steering wheel mounted audio controls, Tachometer, Telescoping steering wheel, Tilt steering wheel, Traction control, Trip computer, Turn signal indicator mirrors, Variably intermittent wipers, Weather band radio, and Wireless Headsets Vehicle may not have all options as described due to automated process. Available only to qualified customers through Mercedes-Benz Financial Services at Loeber Motors through April 30, 2019. Not everyone will qualify. 36 months lease, 10K miles per year. Payment based on MSRP of $63,295 less the suggested dealer contribution of $2,109 resulting in a total gross capitalized cost of $61,186. Excludes title, taxes, registration, license fees, insurance, dealer prep and additional options. Total monthly payments equal $25,164. $5,793 Cash due at signing includes $4,299 capitalized cost reduction, $795 acquisition fee and first month’s lease payment of $699. No security deposit required. At lease end, lessee pays for any amounts due under the lease, any official fees and taxes related to the scheduled termination, excess wear and use plus $0.25/mile over 30,000 miles, and $595 vehicle turn-in fee. Purchase option at lease end for $33,546 plus taxes (and any other fees and charges due under the applicable lease agreement) in example shown. Subject to credit approval. Specific vehicles are subject to availability and may have to be ordered. See dealer for details. Dealer not responsible for pricing errors in this advertisement. 2019 Mercedes-Benz E-Class E 450 4MATIC® 4MATIC® 3.0L V6 BiTurbo 9-Speed Automatic Lunar Blue Metallic Sunroof / Panorama Roof, NAVIGATION!, Backup Camera, Bluetooth, Hands-Free, AWD / 4WD, Heated Seats, Keyless Entry, Premium Sound, Premium Package, BLIND SPOT ASSIST, KEYLESS-GO. With Available Options Like AMG Line Package (AMG Bodystyling, AMG Floor Mats, and Black Headliner), designo Black/Titanium Grey Pearl Leather Package (designo Black DINAMICA Headliner, designo Black/Titanium Grey Pearl Nappa Leather, designo Floormats, and Upper Dashboard & Doors in designo Nappa Leather), Driver Assistance Package (Active Brake Assist w/Cross-Traffic Function, Active Lane Change Assist, Active Steering Assist, PRE-SAFE PLUS Rear-End Collision Protection, Route-Based Speed Adaptation, and Speed Limit Assist), Exterior Lighting Package (Adaptive Highbeam Assist, Corner-Illuminating Lamps, and LED Intelligent Light System), Parking Assistance Package (Active Parking Assist and Surround View Camera System), Premium 1 Package (Electronic Trunk Closer, HANDS-FREE ACCESS, Inductive Wireless Charging w/NFC Pairing, KEYLESS GO®, and SiriusXM Satellite Radio), 12.3" Digital Instrument Cluster, 19" AMG® Twin 5-Spoke Wheels, 4-Way Lumbar Support, 4-Wheel Disc Brakes, 8 Speakers, ABS brakes, AIR BODY CONTROL Air Suspension, Air Conditioning, Alloy wheels, AM/FM radio, Android Auto, Anti-whiplash front head restraints, Apple CarPlay, Auto tilt-away steering wheel, Auto-dimming door mirrors, Auto-dimming Rear-View mirror, Automatic temperature control, Brake assist, Bumpers: body-color, Burmester Surround Sound System, Center Console in Light Brown Sen Wood, Delay-off headlights, Driver door bin, Driver vanity mirror, Dual front impact airbags, Dual front side impact airbags, DVD-Audio, Electronic Stability Control, Exterior Parking Camera Rear, Four wheel independent suspension, Front anti-roll bar, Front Bucket Seats, Front Center Armrest, Front dual zone A/C, Front reading lights, Fully automatic headlights, Garage door transmitter: Homelink, Genuine wood dashboard insert, Genuine wood door panel insert, HD Radio w/SIRIUS Satellite & Real-Time Traffic, Head restraints memory, Heated & Active Ventilated Front Seats, Heated door mirrors, Heated front seats, Illuminated entry, Knee airbag, Leather Shift Knob, Leather Upholstery, Low tire pressure warning, Memory seat, Multi-Contour Front Seats w/Massage Feature, Navigation System, Occupant sensing airbag, Outside temperature display, Overhead airbag, Overhead console, Panic alarm, Passenger door bin, Passenger vanity mirror, Power adjustable front head restraints, Power door mirrors, Power driver seat, Power Front Seats w/Memory, Power moonroof: Panorama, Power passenger seat, Power Passenger Seat w/Memory, Power steering, Power windows, Premium audio system: COMAND, Radio data system, Radio: COMAND Navigation, Rain sensing wipers, Rear anti-roll bar, Rear window defroster, Remote keyless entry, Security system, Smartphone Integration Package - Apply CarPlay, Android Auto, Speed control, Speed-sensing steering, Split folding rear seat, Steering wheel memory, Steering wheel mounted audio controls, Tachometer, Telescoping steering wheel, Tilt steering wheel, Traction control, Trip computer, Turn signal indicator mirrors, Variably intermittent wipers, and Weather band radio Vehicle may not have all options as described due to automated process. Available only to qualified customers through Mercedes-Benz Financial Services at Loeber Motors through April 30, 2019. Not everyone will qualify. 36 months lease, 10K miles per year. Payment based on MSRP of $56,495 less the suggested dealer contribution of $2,903 resulting in a total gross capitalized cost of $53,592. Excludes title, taxes, registration, license fees, insurance, dealer prep and additional options. Total monthly payments equal $20,844. $5,393 Cash due at signing includes $3,999 capitalized cost reduction, $795 acquisition fee and first month’s lease payment of $599. No security deposit required. At lease end, lessee pays for any amounts due under the lease, any official fees and taxes related to the scheduled termination, excess wear and use plus $0.25/mile over 30,000 miles, and $595 vehicle turn-in fee. Purchase option at lease end for $31,072 plus taxes (and any other fees and charges due under the applicable lease agreement) in example shown. Subject to credit approval. Specific vehicles are subject to availability and may have to be ordered. See dealer for details. Dealer not responsible for pricing errors in this advertisement. 2019 Mercedes-Benz C-Class C 300 4MATIC® 4MATIC® 2.0L I4 Turbocharged 9-Speed Automatic Graphite Gray Metallic Backup Camera, Bluetooth, Hands-Free, AWD / 4WD, Heated Seats, Premium Sound, Premium Package, BLIND SPOT ASSIST, KEYLESS-GO. With Available Options Like AMG Line (AMG Line (772), AMG Line Exterior, AMG Line Interior, Black Fabric Headliner, Diamond Grille, and Sport Suspension), Cabrio Comfort Package, Multimedia Package (COMAND Navigation and Map Updates for 3 Years), Parking Assistance Package (PARKTRONIC w/Active Parking Assist and Surround View System), Premium Package (AIRCAP, Burmester Surround Sound System, Power Folding Mirrors, and Semi-Automatic Trunk Separator), 4-Way Lumbar Support, 4-Wheel Disc Brakes, 5 Speakers, 64-Color Ambient Lighting, ABS brakes, Air Conditioning, Alloy wheels, AM/FM radio, Android Auto, Anti-whiplash front head restraints, Apple CarPlay, Auto tilt-away steering wheel, Auto-dimming door mirrors, Auto-dimming Rear-View mirror, Automatic temperature control, Black SoftTop, Blind spot sensor: Blind Spot Assist warning, Brake assist, Bumpers: body-color, Child-Seat-Sensing Airbag, Chrome Door Handle Inserts, Compass, Convertible roof lining, Convertible roof wind blocker, Delay-off headlights, Driver door bin, Driver vanity mirror, Dual front impact airbags, Dual front side impact airbags, Electronic Stability Control, Exterior Parking Camera Rear, Four wheel independent suspension, Front anti-roll bar, Front Bucket Seats, Front Center Armrest, Front dual zone A/C, Front reading lights, Fully automatic headlights, Garage door transmitter: Homelink, Genuine wood console insert, Genuine wood door panel insert, Glass rear window, HD-Radio, Head restraints memory, Heated door mirrors, Heated Front Seats, Heated front seats, Heated Steering Wheel, Illuminated Door Sills, Illuminated entry, Illuminated Star, Inductive Wireless Charging & NFC Pairing, Integrated roll-over protection, Knee airbag, Low tire pressure warning, MB-Tex Upholstery, Memory seat, Occupant sensing airbag, Outside temperature display, Overhead airbag, Overhead console, Panic alarm, Passenger door bin, Passenger vanity mirror, Power adjustable front head restraints, Power convertible roof, Power door mirrors, Power driver seat, Power Driver Seat & Steering Column w/Memory, Power passenger seat, Power steering, Power windows, Radio data system, Radio: Audio 20 - Radio w/Bluetooth, Rain sensing wipers, Rear anti-roll bar, Rear fog lights, Rear side impact airbag, Rear window defroster, Remote keyless entry, Security system, Single CD Player, Smartphone Integration Package - Apply CarPlay, Android Auto, Speed control, Speed-sensing steering, Split folding rear seat, Steering wheel memory, Steering wheel mounted audio controls, Tachometer, Telescoping steering wheel, Tilt steering wheel, Traction control, Trip computer, Turn signal indicator mirrors, Variably intermittent wipers, and Weather band radio Vehicle may not have all options as described due to automated process. 2019 Mercedes-Benz C-Class C 300 4MATIC® 4MATIC® 2.0L I4 Turbocharged 9-Speed Automatic Black NAVIGATION!, Backup Camera, Bluetooth, Hands-Free, AWD / 4WD, Heated Seats, Keyless Entry, Premium Sound, Premium Package, BLIND SPOT ASSIST, KEYLESS-GO. 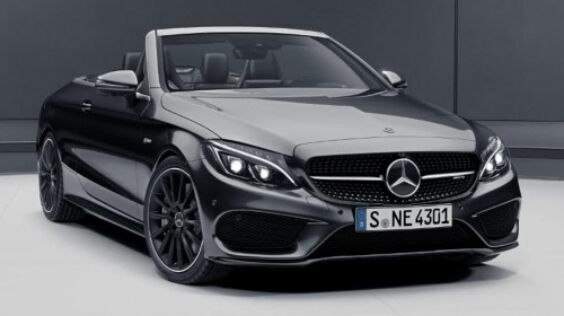 With Available Options Like AMG Line (AMG Line (772), AMG Line Exterior, AMG Line Interior, Black Fabric Headliner, Diamond Grille, and Sport Suspension), Cabrio Comfort Package, Multimedia Package (COMAND Navigation and Map Updates for 3 Years), Parking Assistance Package (PARKTRONIC w/Active Parking Assist and Surround View System), Premium Package (AIRCAP, Burmester Surround Sound System, Power Folding Mirrors, and Semi-Automatic Trunk Separator), 4-Way Lumbar Support, 4-Wheel Disc Brakes, 5 Speakers, 64-Color Ambient Lighting, ABS brakes, Air Conditioning, Alloy wheels, AM/FM radio, Android Auto, Anti-whiplash front head restraints, Apple CarPlay, Auto tilt-away steering wheel, Auto-dimming door mirrors, Auto-dimming Rear-View mirror, Automatic temperature control, Black SoftTop, Blind spot sensor: Blind Spot Assist warning, Brake assist, Bumpers: body-color, Child-Seat-Sensing Airbag, Compass, Convertible roof lining, Convertible roof wind blocker, Delay-off headlights, Driver door bin, Driver vanity mirror, Dual front impact airbags, Dual front side impact airbags, Electronic Stability Control, Exterior Parking Camera Rear, Four wheel independent suspension, Front anti-roll bar, Front Bucket Seats, Front Center Armrest, Front dual zone A/C, Front reading lights, Fully automatic headlights, Garage door transmitter: Homelink, Genuine wood console insert, Genuine wood door panel insert, Glass rear window, HD-Radio, Head restraints memory, Heated door mirrors, Heated Front Seats, Heated front seats, Heated Steering Wheel, Illuminated Door Sills, Illuminated entry, Illuminated Star, Inductive Wireless Charging & NFC Pairing, Integrated roll-over protection, Knee airbag, Low tire pressure warning, MB-Tex Upholstery, Memory seat, Occupant sensing airbag, Outside temperature display, Overhead airbag, Overhead console, Panic alarm, Passenger door bin, Passenger vanity mirror, Power adjustable front head restraints, Power convertible roof, Power door mirrors, Power driver seat, Power Driver Seat & Steering Column w/Memory, Power passenger seat, Power steering, Power windows, Radio data system, Radio: Audio 20 - Radio w/Bluetooth, Rain sensing wipers, Rear anti-roll bar, Rear fog lights, Rear side impact airbag, Rear window defroster, Remote keyless entry, Security system, Single CD Player, Smartphone Integration Package - Apply CarPlay, Android Auto, Speed control, Speed-sensing steering, Split folding rear seat, Steering wheel memory, Steering wheel mounted audio controls, Tachometer, Telescoping steering wheel, Tilt steering wheel, Traction control, Trip computer, Turn signal indicator mirrors, Variably intermittent wipers, and Weather band radio Vehicle may not have all options as described due to automated process. 2019 Mercedes-Benz C-Class C 300 4MATIC® 4MATIC® 2.0L I4 Turbocharged 9-Speed Automatic Graphite Gray Metallic NAVIGATION!, Backup Camera, Bluetooth, Hands-Free, AWD / 4WD, Keyless Entry, Multi-zone Climate Control, Premium Sound, Premium Package, BLIND SPOT ASSIST, KEYLESS-GO. With Available Options Like Cabrio Comfort Package, Parking Assistance Package (PARKTRONIC w/Active Parking Assist and Surround View System), Premium Package (AIRCAP, Burmester Surround Sound System, Power Folding Mirrors, and Semi-Automatic Trunk Separator), 4-Way Lumbar Support, 4-Wheel Disc Brakes, 5 Speakers, 64-Color Ambient Lighting, ABS brakes, Air Conditioning, Alloy wheels, AM/FM radio, Anti-whiplash front head restraints, Auto tilt-away steering wheel, Auto-dimming door mirrors, Auto-dimming Rear-View mirror, Automatic temperature control, Black SoftTop, Blind spot sensor: Blind Spot Assist warning, Brake assist, Bumpers: body-color, Child-Seat-Sensing Airbag, Compass, Convertible roof lining, Convertible roof wind blocker, Delay-off headlights, Driver door bin, Driver vanity mirror, Dual front impact airbags, Dual front side impact airbags, Electronic Stability Control, Exterior Parking Camera Rear, Four wheel independent suspension, Front anti-roll bar, Front Bucket Seats, Front Center Armrest, Front dual zone A/C, Front reading lights, Fully automatic headlights, Garage door transmitter: Homelink, Genuine wood console insert, Genuine wood door panel insert, Glass rear window, Head restraints memory, Heated door mirrors, Heated Front Seats, Heated front seats, Heated Steering Wheel, Illuminated Door Sills, Illuminated entry, Illuminated Star, Inductive Wireless Charging & NFC Pairing, Integrated roll-over protection, Knee airbag, Low tire pressure warning, MB-Tex Upholstery, Memory seat, Occupant sensing airbag, Outside temperature display, Overhead airbag, Overhead console, Panic alarm, Passenger door bin, Passenger vanity mirror, Power adjustable front head restraints, Power convertible roof, Power door mirrors, Power driver seat, Power Driver Seat & Steering Column w/Memory, Power passenger seat, Power steering, Power windows, Radio data system, Radio: Audio 20 - Radio w/Bluetooth, Rain sensing wipers, Rear anti-roll bar, Rear Chrome Trim, Rear fog lights, Rear side impact airbag, Rear window defroster, Remote keyless entry, Security system, Single CD Player, Speed control, Speed-sensing steering, Split folding rear seat, Steering wheel memory, Steering wheel mounted audio controls, Tachometer, Telescoping steering wheel, Tilt steering wheel, Traction control, Trip computer, Turn signal indicator mirrors, Variably intermittent wipers, and Weather band radio Vehicle may not have all options as described due to automated process. 2019 Mercedes-Benz SLC SLC 300 RWD 2.0L Turbocharged 9-Speed Automatic Polar White NAVIGATION!, Backup Camera, Bluetooth, Hands-Free, Heated Seats, Keyless Entry, Premium Wheels, Premium Sound, Premium Package, BLIND SPOT ASSIST, KEYLESS-GO. With Available Options Like AMG Line Exterior (18" AMG® Multi-Spoke Wheels, Floormats, Galvanized Shift Paddles, and Sport Body Styling), Premium Package (AIRSCARF® Ventilated Headrest, Blind Spot Assist, Dual-Zone Automatic Climate Control, Heated Front Seats, KEYLESS GO®, and SiriusXM Satellite Radio), Smartphone Integration Package (Android Auto, Apple CarPlay, and Smartphone Integration Package - Apply CarPlay, Android Auto), Sport Package USA, 4-Way Lumbar Support, 4-Wheel Disc Brakes, 8 Speakers, ABS brakes, Air Conditioning, Alloy wheels, AM/FM radio, Analog Clock on Dashtop, Anti-whiplash front head restraints, Auto tilt-away steering wheel, Auto-dimming door mirrors, Auto-dimming Rear-View mirror, Brake assist, Bumpers: body-color, Burl Walnut Wood Trim, CD player, Child-Seat-Sensing Airbag, Compass, Convertible HardTop, Convertible roof lining, Convertible roof wind blocker, Delay-off headlights, Driver door bin, Driver vanity mirror, Dual front impact airbags, Dual front side impact airbags, Electronic Stability Control, Exterior Parking Camera Rear, Four wheel independent suspension, Front anti-roll bar, Front Bucket Seats, Front Center Armrest, Front reading lights, Fully automatic headlights, Garage door transmitter: Homelink, Glass rear window, harman/kardon® Logic 7® Surround Sound System, Heated door mirrors, Illuminated entry, Integrated roll-over protection, Knee airbag, Leather Shift Knob, Low tire pressure warning, MB-Tex Upholstery, Memory seat, Occupant sensing airbag, Outside temperature display, Overhead airbag, Overhead console, Panic alarm, Passenger door bin, Passenger vanity mirror, Power convertible roof, Power door mirrors, Power driver seat, Power passenger seat, Power Seats w/Memory, Power steering, Power windows, Radio data system, Radio: Audio System w/AM/FM Tuner/In-Dash CD, Rain sensing wipers, Rear anti-roll bar, Rear Deck Spoiler, Rear fog lights, Rear window defroster, Remote keyless entry, Security system, Speed control, Speed-sensing steering, Sport steering wheel, Steering wheel memory, Steering wheel mounted audio controls, Tachometer, Telescoping steering wheel, Tilt steering wheel, Traction control, Trip computer, Turn signal indicator mirrors, Variably intermittent wipers, and Weather band radio Vehicle may not have all options as described due to automated process. 2019 Mercedes-Benz E-Class E 450 4MATIC® 4MATIC® 3.0L V6 BiTurbo 9-Speed Automatic Polar White Sunroof / Panorama Roof, Backup Camera, Bluetooth, Hands-Free, AWD / 4WD, Heated Seats, Keyless Entry, Leather Seats, Premium Sound, Premium Package, BLIND SPOT ASSIST, KEYLESS-GO. With Available Options Like AMG Line Package (AMG Bodystyling, AMG Floor Mats, and Black Headliner), Exterior Lighting Package (Adaptive Highbeam Assist, Corner-Illuminating Lamps, and LED Intelligent Light System), Parking Assistance Package (Active Parking Assist and Surround View Camera System), Premium 1 Package (Electronic Trunk Closer, HANDS-FREE ACCESS, Inductive Wireless Charging w/NFC Pairing, KEYLESS GO®, and SiriusXM Satellite Radio), 4-Way Lumbar Support, 4-Wheel Disc Brakes, 8 Speakers, ABS brakes, Air Conditioning, Alloy wheels, AM/FM radio, Android Auto, Anti-whiplash front head restraints, Apple CarPlay, Auto tilt-away steering wheel, Auto-dimming door mirrors, Auto-dimming Rear-View mirror, Automatic temperature control, Blind Spot Assist, Brake assist, Bumpers: body-color, Burmester Surround Sound System, Center Console in Light Brown Sen Wood, Delay-off headlights, Driver door bin, Driver vanity mirror, Dual front impact airbags, Dual front side impact airbags, DVD-Audio, Electronic Stability Control, Exterior Parking Camera Rear, Four wheel independent suspension, Front anti-roll bar, Front Bucket Seats, Front Center Armrest, Front dual zone A/C, Front reading lights, Fully automatic headlights, Garage door transmitter: Homelink, Genuine wood dashboard insert, Genuine wood door panel insert, HD Radio w/SIRIUS Satellite & Real-Time Traffic, Head restraints memory, Heated & Active Ventilated Front Seats, Heated door mirrors, Heated front seats, Illuminated Door Sills w/Mercedes-Benz lettering, Illuminated entry, Illuminated Star, Knee airbag, Leather Shift Knob, Leather Upholstery, Low tire pressure warning, Memory seat, Navigation System, Occupant sensing airbag, Outside temperature display, Overhead airbag, Overhead console, Panic alarm, Passenger door bin, Passenger vanity mirror, Power adjustable front head restraints, Power door mirrors, Power driver seat, Power Front Seats w/Memory, Power moonroof: Panorama, Power passenger seat, Power Passenger Seat w/Memory, Power steering, Power windows, Premium audio system: COMAND, Radio data system, Radio: COMAND Navigation, Rain sensing wipers, Rear anti-roll bar, Rear Deck Spoiler, Rear window defroster, Remote keyless entry, Security system, Smartphone Integration Package - Apply CarPlay, Android Auto, Speed control, Speed-sensing steering, Split folding rear seat, Steering wheel memory, Steering wheel mounted audio controls, Tachometer, Telescoping steering wheel, Tilt steering wheel, Traction control, Trip computer, Turn signal indicator mirrors, Variably intermittent wipers, and Weather band radio Vehicle may not have all options as described due to automated process. 2019 Mercedes-Benz E-Class E 450 4MATIC® 4MATIC® 3.0L V6 BiTurbo 9-Speed Automatic Selenite Gray Metallic Sunroof / Panorama Roof, Backup Camera, Bluetooth, Hands-Free, AWD / 4WD, Heated Seats, Keyless Entry, Leather Seats, Premium Package, BLIND SPOT ASSIST, KEYLESS-GO. With Available Options Like Exterior Lighting Package, KEYLESS GO Comfort Package (Hands-Free Access and KEYLESS GO®), Lighting Package Code (Adaptive Highbeam Assist and LED Intelligent Light System), Parking Assistance Package (Parking Assist Code), Premium Package (Blind Spot Assist, Burmester Surround Sound System, Heated Front Seats, Inductive Wireless Charging w/NFC Pairing, and SiriusXM Radio), 3rd row seats: bench, 4-Way Lumbar Support, 4-Wheel Disc Brakes, 8 Speakers, ABS brakes, Air Conditioning, Alloy wheels, AM/FM radio, Android Auto, Anti-whiplash front head restraints, Apple CarPlay, Auto tilt-away steering wheel, Auto-dimming door mirrors, Auto-dimming Rear-View mirror, Auto-leveling suspension, Automatic temperature control, Brake assist, Bumpers: body-color, Center Console in Brown Ash Wood, Delay-off headlights, Driver door bin, Driver vanity mirror, Dual front impact airbags, Dual front side impact airbags, Electronic Stability Control, Emergency communication system: Mercedes me connect, Exterior Parking Camera Rear, Four wheel independent suspension, Front anti-roll bar, Front Bucket Seats, Front Center Armrest, Front dual zone A/C, Front reading lights, Fully automatic headlights, Garage door transmitter: Homelink, Genuine wood console insert, Genuine wood dashboard insert, Genuine wood door panel insert, HD Radio w/SiriusXM Satellite & Real-Time Traffic, Head restraints memory, Heated door mirrors, Heated Steering Wheel, Illuminated entry, Knee airbag, Leather Shift Knob, Leather steering wheel, LED Logo Projectors (Set of 2), Low tire pressure warning, Lowered Suspension w/Selective Damping, MB-Tex Upholstery, Memory seat, Navigation system: COMAND APS, Occupant sensing airbag, Outside temperature display, Overhead airbag, Overhead console, Panic alarm, Panorama Roof, Passenger door bin, Passenger vanity mirror, Power adjustable front head restraints, Power adjustable rear head restraints, Power door mirrors, Power driver seat, Power Front Seats, Power Liftgate, Power moonroof, Power passenger seat, Power steering, Power windows, Premium audio system: COMAND, Pre-Wiring for Rr Seat Ent & Comfort Adapter, Radio data system, Radio: COMAND Navigation System, Rain sensing wipers, Rear anti-roll bar, Rear fog lights, Rear reading lights, Rear seat center armrest, Rear window defroster, Rear window wiper, Remote keyless entry, Roof rack: rails only, Security system, Smartphone Integration Package - Apply CarPlay, Android Auto, Speed control, Speed-sensing steering, Split folding rear seat, Spoiler, Steering wheel memory, Steering wheel mounted audio controls, Tachometer, Telescoping steering wheel, Tilt steering wheel, Traction control, Trip computer, Turn signal indicator mirrors, Variably intermittent wipers, Weather band radio, and Wheels: 18" Twin 5-Spoke Vehicle may not have all options as described due to automated process. Actual lease price determined by your authorized Porsche dealer; your payments may vary. Closed-end lease offered to qualified lessees with approved credit by Porsche Financial Services through participating U.S. dealers. Must take delivery by 4/30/2019. 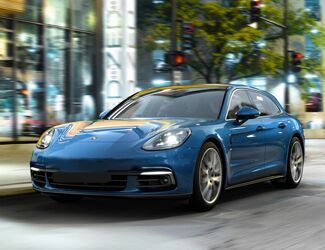 Estimated payments based upon MSRP of $99,230 (includes delivery, processing, and handling fee) for a Model Year 2018 Panamera with the following options: Metallic Paint, Window Trim in High Gloss Silver, Adaptive Air Suspension incl. PASM, 20" Panamera Turbo Wheels, Wheel Center Caps with Colored Porsche Crest, 4-zone Climate Control, Ambient Lighting Plus, Power Seats (14-way) with Memory Package, Power Sunblind for Rear Compartment incl. Power Sunblind for Rear Side Windows, BOSE® Surround Sound System. Model pictured may have optional features and equipment. Price excludes any title, taxes, registration, license fees, insurance, maintenance and dealer fees. Lease payments of $1,099.11 for 36 months total $39,567.96 based on the adjusted capitalized cost of $86,250 (requires dealer contribution which could affect price). Total due from customer at signing $10,819.11 (first month’s payment, acquisition fee of $995 and capitalized cost reduction of $8,725). No security deposit required. At lease end, lessee pays excess wear, $.30/mile over 30,000 miles and $350 disposition fee. Purchase option at lease end $57,553 plus taxes. Specific vehicles and options are subject to availability and your price may vary. For additional information see your participating authorized Porsche dealer or visit Porsche.com/usa. 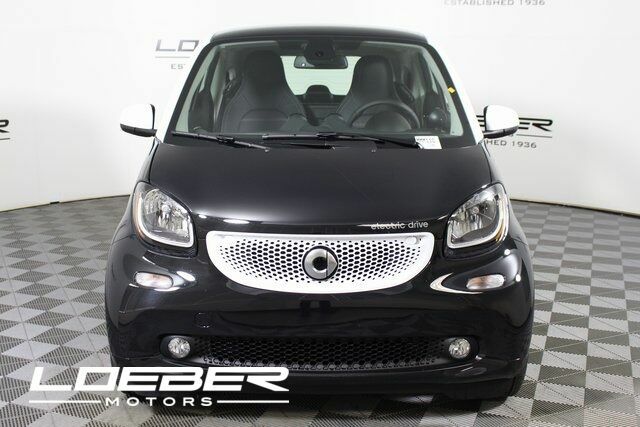 2018 smart Fortwo electric drive prime RWD Zytek Permanent Magnet Motor Single-Speed Automatic Black NAVIGATION!, Backup Camera, Bluetooth, Hands-Free, Leather Seats, ABS brakes, Alloy wheels, Electronic Stability Control, Heated door mirrors, Heated front seats, Heated Seats, Illuminated entry, Leather Seat Trim, Low tire pressure warning, Remote keyless entry, Retractable Cargo Cover, Traction control. With Available Options Like ABS brakes, Alloy wheels, Electronic Stability Control, Heated door mirrors, Heated front seats, Heated Seats, Illuminated entry, Leather Seat Trim, Low tire pressure warning, Remote keyless entry, Retractable Cargo Cover, Traction control, 2 Speakers, Air Conditioning, AM/FM radio, Ambient Lighting, Automatic temperature control, Brake assist, Bucket Seats, Bumpers: body-color, Center Console w/Storage Compartment, Convertible roof lining, Daytime Running Lights w/Integrated Light Guide, Driver door bin, Driver Seat Height Adjuster, Dual front impact airbags, Dual front side impact airbags, Exterior Parking Camera Rear, Fog Lamps w/Cornering Function, Front anti-roll bar, Front Bucket Seats, Front fog lights, Front wheel independent suspension, Fully automatic headlights, Glass rear window, Heated & Power Adjustable Exterior Mirrors, Integrated roll-over protection, Knee airbag, Leather Multifunction Steering Wheel, Leather Shift Knob, Occupant sensing airbag, Outside temperature display, Overhead airbag, Panic alarm, Passenger door bin, Passenger vanity mirror, Power convertible roof, Power door mirrors, Power steering, Power windows, prime base upholstery, Radio data system, Radio: smart Audio System, Rain & Light Sensor, Rain sensing wipers, Rear fog lights, Rear window defroster, Rear window wiper, Security system, Speed control, Speed-Sensitive Wipers, Spoiler, Sport steering wheel, Steering wheel mounted audio controls, and Trip computer Vehicle may not have all options as described due to automated process. 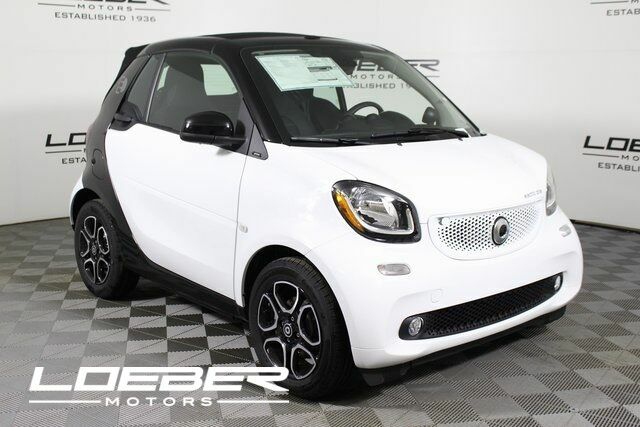 2018 smart Fortwo electric drive prime RWD Zytek Permanent Magnet Motor Single-Speed Automatic White Backup Camera, Bluetooth, Hands-Free, Heated Seats, Leather Seats, ABS brakes, Electronic Stability Control, Heated door mirrors, Heated front seats, Heated Seats, Illuminated entry, Leather Seat Trim, Low tire pressure warning, Remote keyless entry, Retractable Cargo Cover, Traction control. With Available Options Like ABS brakes, Electronic Stability Control, Heated door mirrors, Heated front seats, Heated Seats, Illuminated entry, Leather Seat Trim, Low tire pressure warning, Remote keyless entry, Retractable Cargo Cover, Traction control, 2 Speakers, Air Conditioning, AM/FM radio, Ambient Lighting, Automatic temperature control, Brake assist, Bucket Seats, Bumpers: body-color, Driver door bin, Driver Seat Height Adjuster, Dual front impact airbags, Dual front side impact airbags, Exterior Parking Camera Rear, Fog Lamps w/Cornering Function, Front anti-roll bar, Front Bucket Seats, Front fog lights, Front wheel independent suspension, Fully automatic headlights, Heated & Power Adjustable Exterior Mirrors, Knee airbag, Leather Multifunction Steering Wheel, Leather Shift Knob, LED Lighting, Occupant sensing airbag, Outside temperature display, Overhead airbag, Panic alarm, Panorama Roof, Passenger door bin, Passenger Footwell Cargo Net, Passenger vanity mirror, Power door mirrors, Power steering, Power windows, prime base upholstery, Radio data system, Radio: smart Audio System, Rain & Light Sensor, Rain sensing wipers, Rear fog lights, Rear window defroster, Rear window wiper, Security system, Speed control, Speed-Sensitive Wipers, Spoiler, Sport steering wheel, Steering wheel mounted audio controls, Trip computer, and Wheels: 15" 5-Twin-Spoke Light-Alloy Vehicle may not have all options as described due to automated process. 2018 smart Fortwo electric drive Passion RWD Zytek Permanent Magnet Motor Single-Speed Automatic White Backup Camera, Bluetooth, Hands-Free, ABS brakes, Electronic Stability Control, Heated door mirrors, Illuminated entry, Low tire pressure warning, Remote keyless entry, Retractable Cargo Cover, Traction control. 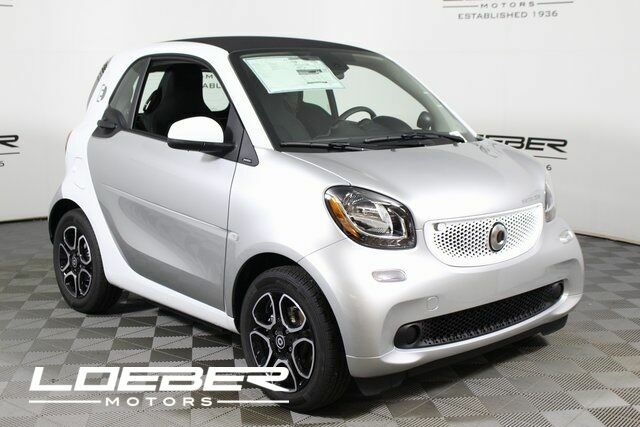 2018 smart Fortwo electric drive prime RWD Zytek Permanent Magnet Motor Single-Speed Automatic Black Backup Camera, Bluetooth, Hands-Free, Heated Seats, Leather Seats, ABS brakes, Alloy wheels, Electronic Stability Control, Heated door mirrors, Heated front seats, Heated Seats, Illuminated entry, Leather Seat Trim, Low tire pressure warning, Remote keyless entry, Retractable Cargo Cover, Traction control. At Loeber Motors we want you to find the perfect vehicle, and we'll work hard to make sure you do. Simply tell us what you're looking for and when it's available you'll be the first to know! By submitting this form, you agree to be contacted by Loeber Motors with information regarding the vehicle you are searching for. All pricing and details are believed to be accurate, but we do not warrant or guarantee such accuracy. The prices shown above, may vary from region to region, as will incentives, and are subject to change. Vehicle information is based off standard equipment and may vary from vehicle to vehicle. Call 847-933-7868 or email for complete vehicle specific information.